The Walking Dead Season 9, Episode 16 'The Storm' Review – AiPT! After last week’s bloodbath, we still have one more snow-filled episode before The Walking Dead wraps up what has been by far its best season in years. 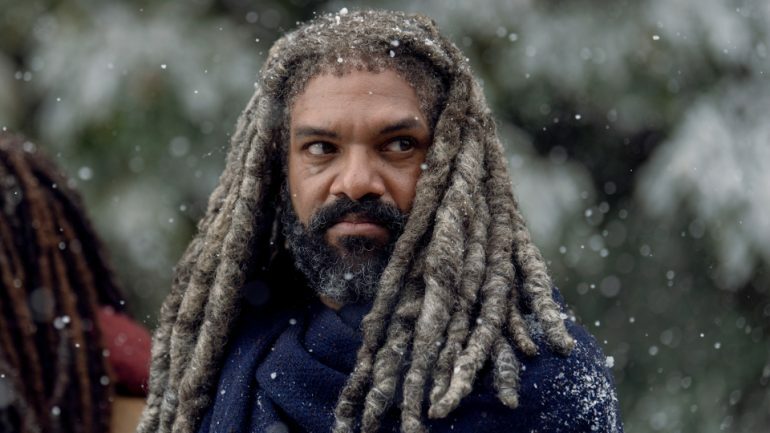 The episode opens with Ezekiel on a radio, recounting how the Kingdom has fallen apart in the wake of the Whisperers’ devastating attack…but mostly because of the cold weather, thus proving that even after the zombie apocalypse, states below the Mason-Dixon line are still prone to abandoning everything at the first sign of snow. Accompanied by Daryl and Michonne (and Lydia), the group heads off to the Hilltop for refuge. Along the way, they see Whisperers tracking them from a distance. Alden takes the opportunity to snipe at Lydia about “her people” before Daryl puts a stop to it. Daryl also vouches for Lydia to Carol, insisting that she’s a good kid. Carol responds by saying that all she can see when she looks at the young girl is her dead son Henry. Later, Ezekiel takes notice of Carol and Daryl talking to each other (!). His jealous leering is interrupted when Jerry tells him that his barometer indicates a terrible storm coming in. After Daryl kills a zombie and goes to retrieve his crossbow arrow, Ezekiel follows him. When they are alone, he asks Daryl to back off so he can try to make things work again with Carol. Daryl responds with the expected grunts followed by a hard redneck stare before storming off without an answer. Meanwhile, Lydia wanders off by herself and finds a walker frozen into the ground. She takes off her glove and offers her hand to it, but is stopped when Carol finds her. As night falls and the weather continues to deteriorate, the group finds sanctuary in the…uh, Sanctuary. Or the bombed out ruins of what it used to be, at least. Back in Alexandria, Eugene walks in on Rosita and Gabriel having an intimate moment to announce that they all need to find somewhere warm to stay before the winter storm blows in. Gabriel also brings up the unpleasant fact that they can’t leave Negan down in his cell to freeze to death. Once they get everyone inside the cozy looking shelter, Negan immediately goes to work sowing seeds of discord. After being admonished by Judith for using foul language (and actually heeding her rebuke) he gleefully points out how weird it must be for Rosita to be in a relationship with Gabriel while she’s pregnant with her doctor’s (Siddiq’s) child. Meanwhile, Judith shares her concern over Dog, who she was supposed to be taking care of for Daryl and has gone missing. All of cabin fever drama is brought to an abrupt halt when an odd smell leads to an explosion from the fireplace. After everyone is determined to be okay, Eugene diagnoses the chimney as being “gunkified” and unusable, which is a serious problem when central heating doesn’t exist. The group decides to relocate to Aaron’s house. Back at the Sanctuary, Carol asks Daryl if something happened between him and Ezekiel. Daryl denies it, which Carol predictably sees through. She then explains that Ezekiel blames him for their relationship problems because he can’t blame her. Daryl offers to take Lydia with him to Alexandria while Lydia eavesdrops. Later, the group tries to come up with a plan to get to the next way station, which has become necessary due to a lack of supplies in the gutted Sanctuary. Carol insists they cross a frozen lake to cut their travel time and get there faster. Unfortunately, that path would also take them right through Alpha’s territory. Before they leave, Michonne gives a bummed out Ezekiel a pep talk, reminding him that the charter they all signed means something. She also points out Alpha (and presumably other Whisperers) could walk among them at the fair because the communities didn’t know each other, which she blames herself for. As the group heads out, they encounter walkers that have been frozen solid, which appears to bode well for the rest of their journey. Once they make it to the river, the group follows Daryl one-by-one across the ice. Things go smoothly until walkers who were definitely not frozen solid start crawling out from under the snow. Daryl almost gets bitten by one, but ends up surviving via a sweet ice pick kill. Meanwhile, Lydia has wandered off on another suicide journey. Carol once again goes to find her. When she does, Lydia refuses to follow her back to the group. Instead, she angrily declares that everyone is acting like getting to Hilltop will make things better when she knows it won’t. She also reminds Carol that Henry is dead because of her–and that she knows everyone will always hate her for the death and heartache her presence has caused. Lydia then begs Carol to kill her, punctuating her death plea by admitting that her mother was right when she called her weak. Before things can get any more awkward, a random zombie shows up, which Carol kills before telling Lydia that she’s not weak and offering her hand. Lydia takes it and heads back with Carol to the rest of the group. As the Alexandria group slowly trudges to Aaron’s house, Judith hears Dog barking and runs off to find him. Negan shouts to Judith and and runs after her. While searching for her in the blizzard, he falls and badly injuries his leg. Despite being in considerable pain, he continues looking, eventually finding both Judith and Dog. Judith appears to be going into hypothermic shock and is barely able to stand, so he carries her to a nearby building and gives her his jacket. The two playfully banter a bit before steeling themselves to head back toward town. The Kingdom group makes it to Hilltop. While they all huddle inside the town hall, Lydia asks why Daryl left Alexandria. He says he’ll explain it to her one day. Meanwhile, Carol tearfully tells Ezekiel she’s leaving for Alexandria–and leaving him. Ezekiel says he’ll never stop loving her. The next day, Daryl, Michonne, Aaron and Lydia make it Alexandria. Michonne is obviously happy to see her kids, Judith and R.J. So is Daryl, who gets into a snowball fight with them. Aaron and Lydia join in, allowing us to see all three characters smile for the first time in what feels like ages. Carol even joins in, showing that maybe this group has a chance to heal from their wounds by being together. We flash forward (I think) to spring in Whisperer territory. Beta is telling Alpha about how awesome she is. Alpha responds by talking about how she’s “made mistakes” and “what comes next.” Then she extends her arm, which Beta starts whipping with a tree branch. Yeah…I got nothing for what’s going on there. The episode ends like it began, with Ezekiel on the radio–and talking to Judith. He sounds hopeful this time, buoyed by Judith’s optimism. After he signs off, the radio crackles a bit before an unfamiliar voice asks if anyone is there. As far the episode’s two codas go, those might be the worst cliffhangers this show has ever had. For the stuff with Beta and Alpha, that felt like pure weirdness without any context. With regards to the radio, it’s hardly the first time we’ve had an unknown transmission. Once again without context, it really doesn’t mean much. As far as the rest of the episode is concerned, The Storm was nowhere near the quality of last week. Thankfully, it still had enough good moments to be a decent episode (or a great one by Season 5-8 standards). Like most episodes under showrunner Angela Kang, the narrative moved forward on multiple fronts. The Kingdom has collapsed and its residence have relocated to Hilltop. Lydia and Carol have begun to mend through the latter’s animosity towards her. Daryl has returned to Alexandria. Negan has begun the process of becoming a part of the community instead of a prisoner (maybe). I’m still not sure how The Kingdom could have gotten so bad that they needed to leave in the dead of winter. Was there really no supply sharing after the fair (especially now with Michonne being onboard with things)? Even if The Kingdom needed to be abandoned, you have to figure that staying put and waiting out the winter would have been a better option–not from a narrative standpoint, but you get what I mean. If you can accept the contrived premise, however, then the journey it provided made for some great character moments. ‘The Storm’ isn’t the best episode of Season 9 by any stretch, but it still worked–both as a good hour of television and a microcosm of the many things The Walking Dead is finally starting to do right again. Let’s hope that trend continues into Season 10. Nowhere near as good as last week, but 'The Storm' still follows the Season 9 trend of episodes that are both entertaining and move the narrative forward. Some fantastic character moments, particularly the ones involving Judith and Negan. Lots of plot lines either moved forward to came to soft resolutions. The snow made for an excellent zombie fight featuring Daryl. The reason for The Kingdom being abandoned seems a little ridiculous. The episode's two cliffhangers might the the worst ones we've ever had on the show.